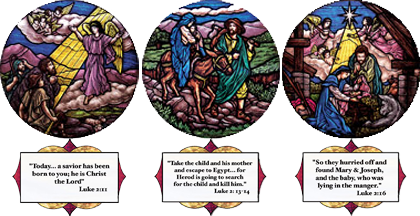 For pricing on our window film CLICK HEREA scripture can be added to any medallion design. Browse the church window film choices below for a design. Then click "View Scripture Choices" (shown right) to get a closer look at medallion & scripture choices. NOTE: Default scripture is meant to be read normally from INSIDE the church, if you need the image flipped in order to be read outdoors, let us know upon ordering.